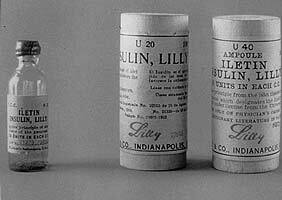 Iletin from Eli Lilly. Beef R/Neutral in varying strengths--not highly purified, nor were there any suspension insulins at the time. Photo is likely ca. 1922-1923. Insulin is a hormone produced by the beta cells of the pancreas. Insulin delivered into the body through a syringe, insulin pen, or other delivery method is known as exogenous insulin. The role of exogenous insulin in treating diabetes mellitus was first discovered, and the substance refined, in 1921 at the University of Toronto by Sir Frederick Banting , and colleagues Best, Collip, and Mcleod. Commercial production began in 1923 at the newly formed Nordisk Insulin Labs (now Novo Nordisk) in Denmark, and at Eli Lilly and Co. in the USA. These are the various insulins discussed on this site. Insulin is necessary to enable the body to perform normally. It controls the rate at which the body's cells can take in fuel (glucose). Without the insulin system, the body would burn fuel whenever it was available, instead of when it was most needed. Actions of insulin-the anabolic (positive or energy-producing) bodily process are shown in green--the catabolic (negative or energy-using) ones are in red. With the insulin system working, insulin allows cells to use glucose found in the bloodstream, keeping them fed and preventing hyperglycemia. In the cells themselves, insulin aids in the anabolic (a positive, building or maintaining process) processes of turning glycogen stored in the liver and in muscles, into energy, and helps transform fatty acids and protein into forms both useful and necessary to the body. It complements or counter-acts the breaking-down the catabolic (breaking-down)  body processes of gluconeogenesis, lipolysis, (fat breakdown) and glycogenolysis (glycogen breakdown). Insulin uses receptors to enter body cells. Glucose can't be used as fuel until it is able to enter the body's cells. Insulin allows glucose to enter body cells, thus the body is able to use the glucose for its fuel. Insulin receptors are cell sites which accept insulin. This allows the cells to accept and use glucose for fuel. In diabetes, insulin is not produced in adequate quantities, or some of the insulin is not accepted by the receptors. While there is plenty of glucose within the system, the body's cells cannot accept it, and suffer what's called intracellular hypoglycemia. The hyperglycemia seen in blood glucose readings represents the glucose present in the body, which, without enough insulin, is unable to use it properly--it's called extracellular hyperglycemia. In those without diabetes, the healthy pancreas secretes insulin in pulses or spurts. Basal insulin secretion is a series of small pulses or spurts at a given rate day and night; these insulin pulses or spurts are to take care of the body's basic needs. When someone without diabetes eats a meal, the pancreas goes into higher gear, producing larger quantities of Post-prandial insulin to handle the additional glucose created by the food. It is this pattern that diabetics try to mimic as closely as possible; with Basal insulin injections for the body's needs without considering food and Bolus insulin injections to cover meals replacing the Basal and Postprandial insulin their bodies no longer produce or do not produce in sufficient quantity. Insulin secretion in non-diabetic human. The peaks represent the additional insulin released at meal times, called post-prandial, or after-meal insulin. Here you see how the non-diabetic body automatically calculates how much insulin is needed to handle the extra glucose generated by the meal and releases it. Another view of endogenous (produced by the body) insulin production of a non-diabetic human. The basal, or body's needs minus the processing of food, insulin levels are the lower, often wavy lines shown. The sharp peaks represent how the body responds automatically with secretion of additional insulin to handle the extra glucose creating by eating meals, which are referred to as post-prandial (after-meals) on this graph. People using insulin try to re-create this pattern as much as possible by using fast or short-acting insulin at meal times. Insulin, then, in 10 words or less, is the hormone that lowers blood glucose and feeds the body. And if you read no further, it would appear that as long as one has some insulin, either endogenous or exogenous, this is simple and everything will be fine. When reading various medical literature about insulin and its actions, one often sees the terms kinetics and dynamics used. Knowing what each means in terms of blood glucose can help you understand where it applies to you or your pet. Insulin Kinetics refers to the time when an insulin can be measured in the bloodstream. It's important to understand that even though it's "officially" made its way there, the insulin has not yet done so in sufficient quantity to effectively begin to lower blood glucose. Insulin Dynamics is the point where it has an effect on blood glucose levels. The dotted line shows insulin entering the bloodstream (kinetics). blood glucose is lowered by it. 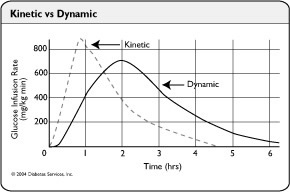 A good illustration of kinetics and dynamics is having a headache and taking an aspirin for it. You will get relief after the aspirin's level in your system has reached the dynamic stage. While it is in the kinetic one, you are still waiting for headache relief. There are other hormones present and also necessary to the body, which do the exact opposite of insulin--raising blood glucose levels. Cortisol,growth hormone, adrenalin AKA epinephrine, glucagon, progesterone and thyroid hormone are considered counterregulatory hormones as far as diabetes and blood glucose levels are concerned. They need just as much consideration as insulin, because changes in their bloodstream levels, can mean a possible interference with insulin, or a need for more of it. These changes can occur normally within the body to supply extra fuel when needed, or as symptoms of a disease state (Acromegaly=too much growth hormone, Cushing's Disease=too much cortisol/cortisone, Hyperthyroidism=too much thyroid hormone, Hypothyroidism=too little thyroid hormone, Addison's disease=too little cortisol/cortisone ), or as a result of other medications, such as steroids. The counter-regulatory hormones such as adrenalin/epinephrine, glucagon and cortisol/cortisone are released to provide extra energy to the body in various circumstances, or if the body believes it's threatened with hypoglycemia. In some cases this is part of the body's "self-defense" mechanism to counter the effects of too much insulin. So there's more than just insulin one needs to think about. It's vital to life whether enough is produced by the body or whether it's injected. The other hormones are also vital to the body and being able to understand how the various hormones react or interact with each other is very helpful in understanding and successfully controlling diabetes. U40 insulins are able to be drawn and dispensed in smaller doses (less than 5 units) with much greater accuracy than their U100 counterparts. This makes them advantageous for use in treating both children and pets, who both have smaller bodies and smaller insulin requirements than adult humans. U40 insulin has its advantages for more than children and pets. Insulin hexamers (as produced by the body or injected) must break down into dimers and monomers to be absorbed. The hexamers of insulin tend to associate with each other (stay together); they cannot be readily absorbed while they remain this way. Diluting insulin into U40 strength forces them into dissociating (staying apart from each other, and becoming dimers and monomers), which means they are absorbed better and more rapidly. An easy way to visualize this might be to think of a whole pie, slicing it into 6 pieces, then putting each piece on a separate plate. The pie can't be eaten until it's cut and everyone has a piece on his or her plate. A normally working pancreas secretes insulin in monomer form, so there's no formation of hexamers by self-association and nothing to break down; the monomer insulin is ready to work. U40 insulin was also the subject of another 1998 study. This one compared it to both U100 insulin and the rapid-acting analog insulin Lispro (The only one marketed at the time.) Insulin lispro, known as Humalog, was found to be only slightly more rapidly absorbed than U40 non-analog insulin. The rapid-acting analog insulins such as Humalog, Novolog, NovoRapid and Apidra have amino acid sequences which are altered to prevent the insulin hexamers from remaining together in self-association. Diluting insulin from U100 strength also prevents this self-association. The fact that U40 insulin has a similar pharmacokinetic profile to analog insulin, has not been lost on the German Institute for Health Care Quality (government department). They proposed a cost-cutting move which would stop prescription coverage of the rapid-acting analogs for all newly-diagnosed Type 2 diabetics in Germany. The decision was reached July 17, 2006; rapid-acting analog insulins are no longer covered unless they are price-equivalent to non-analog insulins or if the patient can medically demonstrate intolerance. It is also possible to delay the absorption of an insulin by increasing its strength. U500 insulin, which is five times more concentrated than U100, has been available through both Lilly and Novo Nordisk (Note: Their similar product is U400 strength insulin) by special order for many years. The insulin's main use is for people with extreme Insulin resistance, and is commercially available only in R/Neutral type. Though it is R/Neutral-type insulin, U400 & U500 insulins have a pharmacokinetic profile more like NPH insulin than U100 R/Neutral. Since there are no additives such as suspensions to alter R/Neutral insulin's action, the strength of the insulin formula hinders its breakdown into dimers and monomers, thus making it much slower-absorbed than U100 and lesser strength insulins. In cases of severe insulin resistance, using a much higher concentration of insulin appears to "negate" the effects of immune-related Insulin resistance. The studies at the link below shows that there was no difference regarding antibodies when these patients were transferred from Iletin II NPH at U100 strength to a form of Iletin II R at U500 strength. However, the stronger insulin reduced their insulin needs from 33-75%. The usual times for onset, peak, and duration are found with the information for the insulin itself, but they also depend on the species, the suspension, and the individual. In particular, a given insulin that lasts, say, 20 hours in humans or dogs is more likely to last 10 hours in cats due to cats' faster metabolism. So the times found here are average for humans and dogs, but will last less time in cats. This insulin chart is a bit dated, but seems to be a good guide to onset, maximum effect (peak) and duration. Looking at NPH for both dogs and cats gives example of cats' faster metabolism; its expected duration for cats is half that for dogs. Porcine insulin is identical to canine. Bovine insulin is similar to feline, differing by only a single amino acid in position 18. (Mnemonic device: piG = doG, Cow = Cat). Both differ in up to four amino acids (positions 8, 10, 18, 30) from natural human insulin. Porcine (pig) and bovine (cow) insulins can be combined to produce a "blended" insulin (such as Iletin I (beef/pork) and PZI Vet). Genetically-engineered artificial insulins with different amino acid composition such as Lantus, Levemir, Humalog, Novolog, and Apidra, are known as analog insulins. Feline insulin compared to Bovine, Porcine and Human versions. Up to 4 amino acids differ. The closest match to feline is bovine with only one amino acid difference; the least close is human with four amino acid differences. Canine insulin compared to Bovine, Porcine, and Human versions. Up to 2 amino acids differ with canine and porcine being identical. Clear soluble insulins have no suspension. The suspension (liquid the insulin is suspended in) is the key to its activity over time. Typical suspensions are Isophane (NPH, Mixed), Zinc (Lente, semilente, Ultralente) and Protamine Zinc (PZI). In general, all insulins with the same suspension will have a similar time activity profile and behave similarly. In non-analog insulins, it is the suspension that makes intermediate and long-acting types work longer than R/neutral. Manufactured insulin diluents contain both suspension and preservative additives which are also present in the insulin(s) they are made to dilute. Using the wrong diluent for an insulin may alter its activity profile, causing the insulin to work to rapidly or too slowly. This is one reason why insulins should be diluted only with the correct approved diluent for that insulin. See injecting insulin, rolling insulin, and diluting insulin and combining insulin. For dosage see Regulation. Note that any insulin, given in overdose, can lead to hypoglycemia and coma or death. For basic insulin use terms, see Onset, Peak, and Duration. For advanced use see also basal, bolus, and booster. For what can go wrong with insulin see absorption, and Obstacles to regulation, especially the Insulin problems section. Before each use, take a moment to inspect the insulin prior to drawing it into the syringe; clear insulins should appear not discolored and clear; suspended insulins should be uniform in their cloudiness. The bottle appears to be frosted. Clear insulin that looks discolored or has turned cloudy, or any containing particles or haze. Cloudy insulin that appears yellowish or remains lumpy or clotted after mixing. If you made a mistake and forgot to put the insulin back into the refrigerator, even for several hours, there should be no problem. Many keep their insulin (see instructions for your brand) at room temperature all the time. When comparing it to insulin which is in the fridge except when used, it may be more likely to have slight potency loss. If the insulin was exposed to heat or direct light for a while when it was out of the refrigerator, or shaken vigorously or dropped a long way, the best thing to do would be to start with a new vial. Some Time Activity information re: NPH/isophane & PZI insulins. Diabetes control in Siberian Husky Case details about using R/neutral and/or mixed insulins in dogs. More general insulin information :Good illustrations and charts for seeing where bovine and porcine insulins differ from human insulin and how analog insulins Lantus (insulin glargine), Novolog (insulin aspart), and Humalog (insulin lispro) have been altered to produce their respective effects. Some absorption discussion related to humans, some of which is relevant to animals, as absorption is an important factor in how the insulin is used for all with diabetes. Time activity profiles for everything except Levemir and any PZI. Aspart/Lispro chart would be applicable for the new Aventis Apidra, as it is also a rapid-acting insulin designed for bolus in humans. A chart of the variations in amino acid sequence on the A and B chains of different species. Dr. Ragnar Hanas is a Swedish pediatrician whose book about Insulin-Dependent Diabetes is clearly written and easy to understand. Unlike many doctors, you feel she's talking with you and not down to you. Even though it was written in 1999 and insulins Lantus and Levemir were not yet marketed, the explanations are classic. She intended it for explaining human diabetes, but there is much we can gain from it too. The link is to a chapter she graciously donated to Children With Diabetes.